HOUSTON – (Realty News Report) – Apartment rents will increase in Houston in 2019 as strong job growth and home buying trends give solid support to the multifamily market, according to a panel of industry executives. Houston’s multifamily occupancy will also edge up slightly to 90 percent, up from 89.6 in 2018, said Bruce McClenny, president of ApartmentData.com. That will be accompanied rent growth of about 3 percent – or about $32 per month to $1,054 for the typical 882-SF apartment. 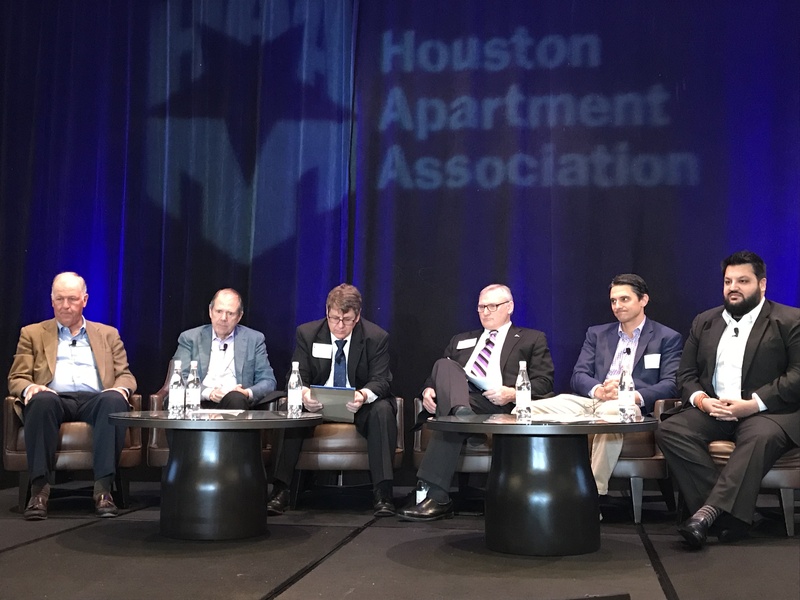 “I’m looking for two to three more years of steady growth,” McClenny told the Houston Apartment Association’s State of the Industry breakfast at the Omni Hotel Galleria Houston. Houston apartment market had jumped sharply, following Hurricane Harvey, which made landfall in Texas on Aug. 25, 2017. After the storm passed, many apartment communities soared to 100 percent occupancy almost overnight. Occupancy gains related to the hurricane have gradually subsided as home repairs were made and people moved out of apartments to return to their houses. “I think 2019 is going to be better than 2018, but just slightly better,” said Ric Campo, CEO of Camden Property Trust, a Houston-based REIT that owns a number of properties in Houston. Camden is constructing a $140 million, 20-story, 275-unit residential tower downtown next to the Toyota Center arena. Houston is expected to add about 71,000 new jobs in 2019, unemployment is low and the economy is in excellent shape, said Patrick Jankowski, senior vice president of research at the Greater Houston Partnership. “The Houston economy right now is in the best shape it’s been since the fracking boom in 2014,” Jankowski said. Oil prices have been hovering around $50 a barrel recently – that’s about the break-even point for many operators in the energy industry, Jankowski said. The stability is a positive theme for the ongoing economy, however the upside is limited. Production is up, but energy companies have learned to operate more efficiently in recent years and that dampens the potential for major job growth in the energy industry. Campo said investors remain interested in Houston. “You don’t have any problem getting institutional capital in Houston, today,” he said. Houston’s economy is diversified and the city is ripe for additional multifamily investment, said Cyrus Bahrami, managing director in Houston for Alliance Residential of Phoenix. Alliance has been actively building projects in the Houston area and more are will break ground in the coming months. “We have seven slated to start over the next year,” he said. Another panelist, Manu Gupta of Indus Management, said there are opportunities in buying Class C projects and spending $5,000 to $15,000 a unit to improve the properties. Demographic trends are playing out in the multifamily market in a strong way. Baby Boomers are moving back to the central city, giving up on empty-nester life in the suburbs, Campo said. Cultural activities, the arts, four-star restaurants draw people to high amenitized rental communities in the Inner Loop. This also adds to urban densification and demand for high-rise properties.